The weekends are getting shorter as we begin to prepare for Thanksgiving and Christmas. I managed to squeeze in a Saturday auction and came home with some nifty treasure. It was one of the auctions where tables full of items were sold as lots so you acquired more than you bargained for. This could either be fun or you had lots to drop off at your local Goodwill. Turned out it was fun as many other winning bidders had items they didn't want and we all ended up swapping with each other. It was a good time seeing what was trash to one and treasure to another and truly is a part of what makes this business so much fun. So below are some of the items I won or swapped for. I swapped portable lawn chairs for a box lot of vintage flower frogs which make festive candy cane holders. Large selection of Wedgwood dinner ware was a winning bid. These are now in my main space at the Buford Queen of Hearts. I won six, mid century punch bowls and kept three and swapped the others. One of my swapped items was this marvelous, mid century lucite ice bucket and tongs. Heavy, ship's decanter has pretty etched and cut roses into it. Found these darling, Art Deco era brushed bronze Gazelle knife rests from France in the bottom of one of my winning auction boxlots. Heavy, Waterford Crystal short vase and a sweet creamer and sugar. More Wedgwood, this group has gold striping on the pieces. Pretty sterling silver overlay on crystal cake platter. Lovely shape. Nice, mid century Italian Claret (wine) pitcher is in beautiful condition with pewter top and handle. Hard-To-Find, Vintage NY-LINT R.G. Le Tourneau TOURNAROCKER, made by NY-LINT Tool & Mfg. Co. in Rockford, Illinois. Terrific flapper era celluloid travel kit. My Victorian space is packed with festive items. 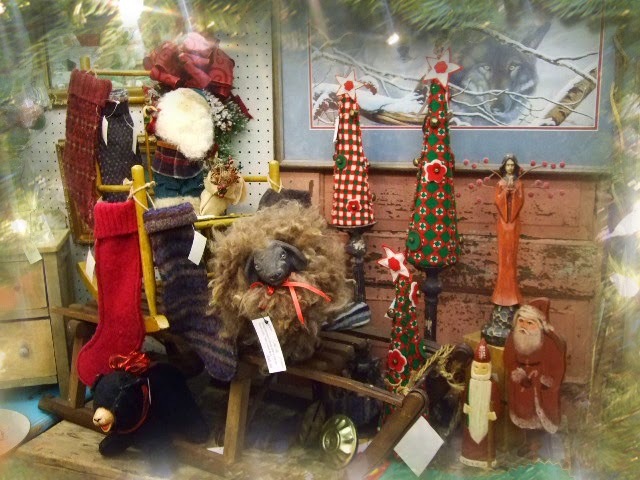 So is my main booth and there is lots to select from to make the holidays festive. It's fun to see how lovely everyone's spaces are during this holiday season. 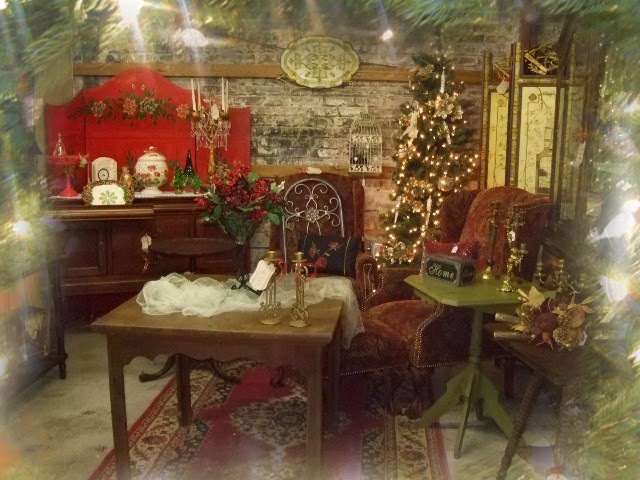 I have another Open House on Wednesday and can't wait as it is a favorite shop, Vintage Village in Snellville. There will be photos. So stay warm and enjoy the week and as always, blessings to you and those you love. Sea Witch. 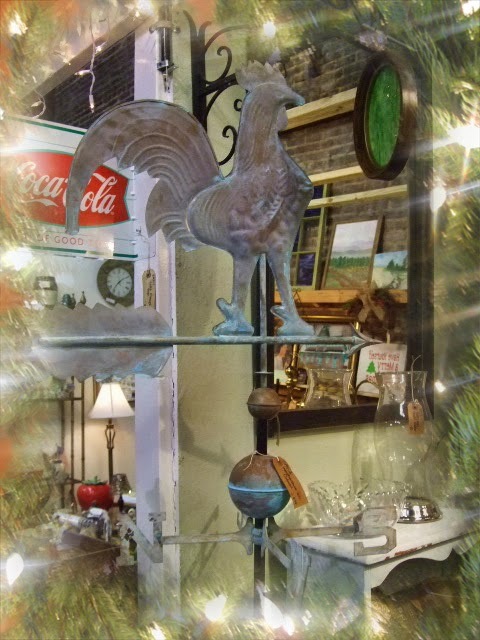 Tis the season and I was off to another Open House, this time in Monroe, GA at Hodge Podge Antique Market. I always find treasure at Hodge Podge and their annual Open House is always a lovely affair. 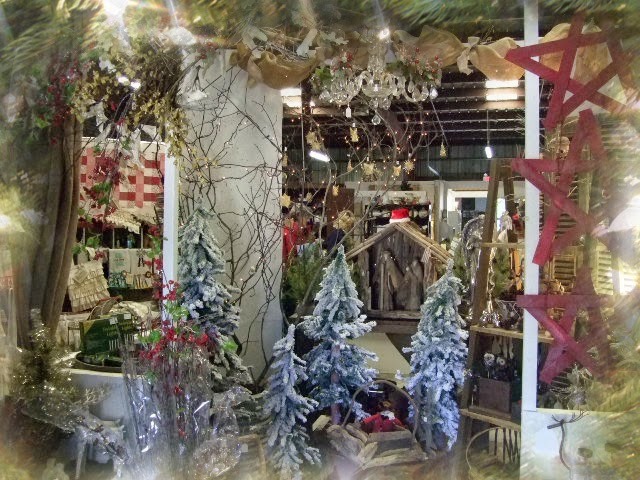 When you walk through the doors, you are faced with this gorgeous, holiday display. 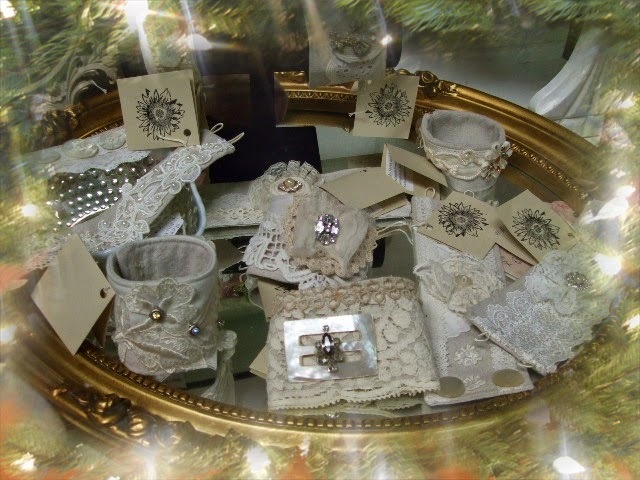 Pretty handcrafted soft bracelets of vintage laces and found objects are so unique. Adorable snowman are made from glass pieces and pretty tinsels. 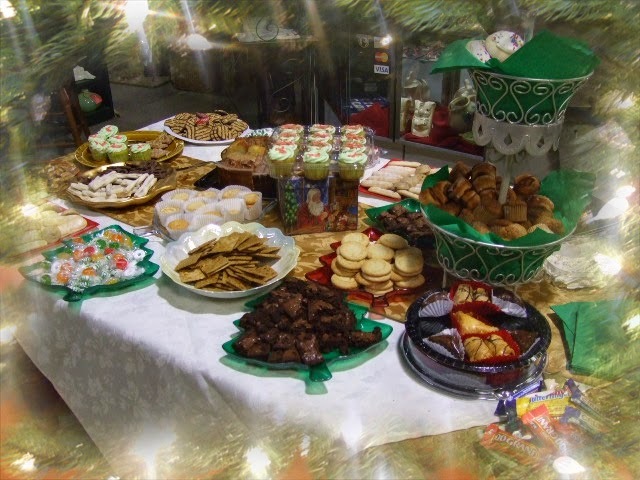 The main buffet table was pregnant with delicious, homemade goodies. 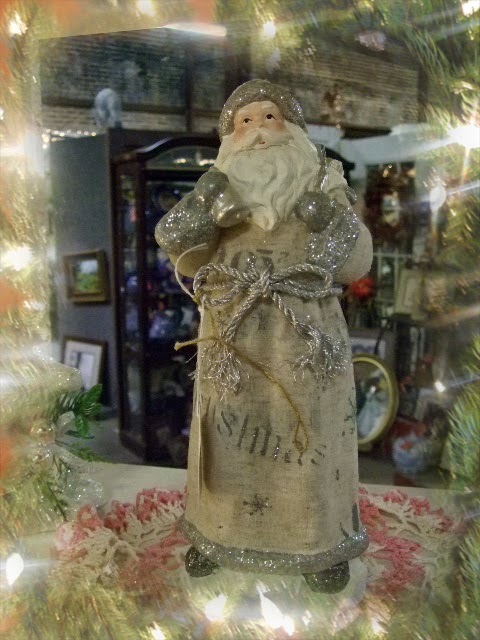 Primitive decorations are filled with holiday charm. Love the look of a cottage Christmas. It wouldn't be Christmas without a handsome St. Nick. I could live in this space. Love this copper weather vane, I would hang mercury glass garland from it. 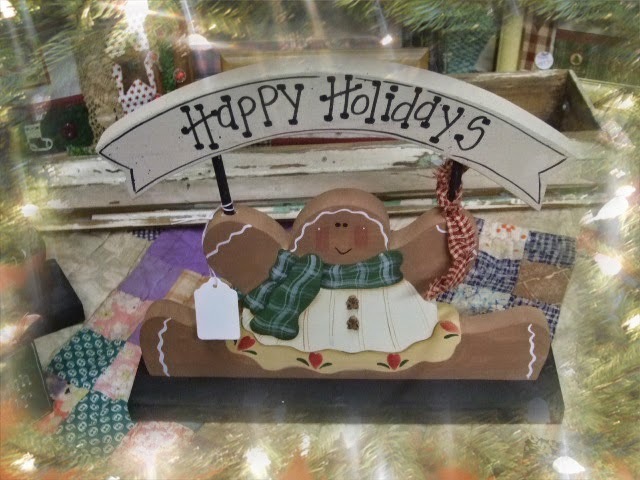 You will find lots of decorative elements to say Happy Holidays at Hodge Podge. Love this grouping of window candelabras. Gorgeous tree was filled with pretty ornaments. This was another festive Open House at Hodge Podge and my visit has become an annual tradition for me. 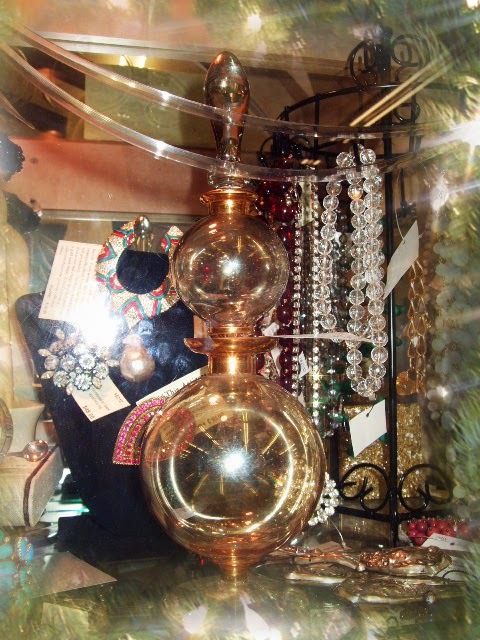 Of course, the fun of the open houses is not only to see gorgeous displays but to do a little treasure hunting. Found some interesting treasure and fluffed up my spaces as well. This sweet flow blue tray has tiny shamrocks on it. I have never come across flow blue with this theme before. Fell into this charming, child's quilt in red and white and it is now in my booth on Church Street at the Buford Queen of Hearts. 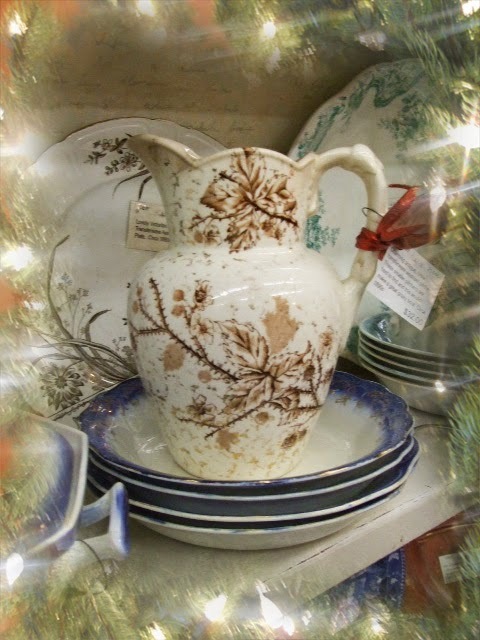 Pretty little brown transfer ware pitcher. Marvelous find, this vintage Ibrice, double cologne bottle. Circa 1930s, this is a rare piece and is in my display case at the Buford Queen of Hearts. Another fantastic find was this hand knotted, silk prayer rug. 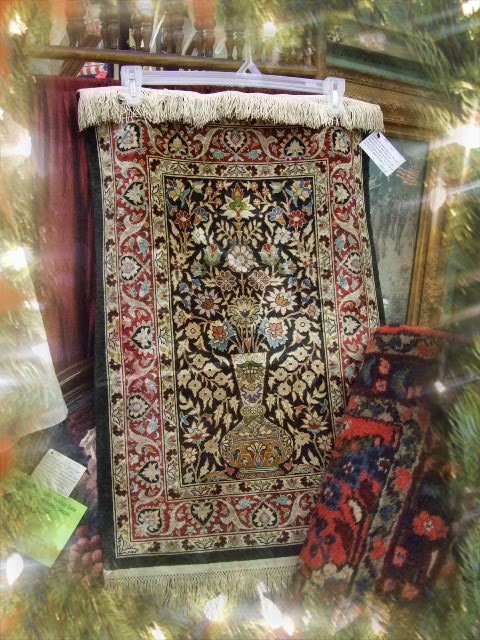 Velvety soft and brilliant colors, this is a gorgeous piece for the Oriental rug collector. Sold quite a few of my Americana holiday pieces so I had to bring in more this weekend. Brought in a huge decorative piece for an entrance or hall. 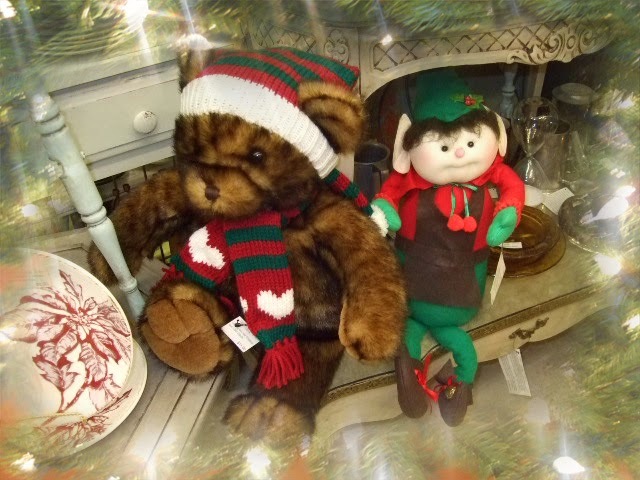 Delightful faux mink bear and elf are adorable decorative pieces. 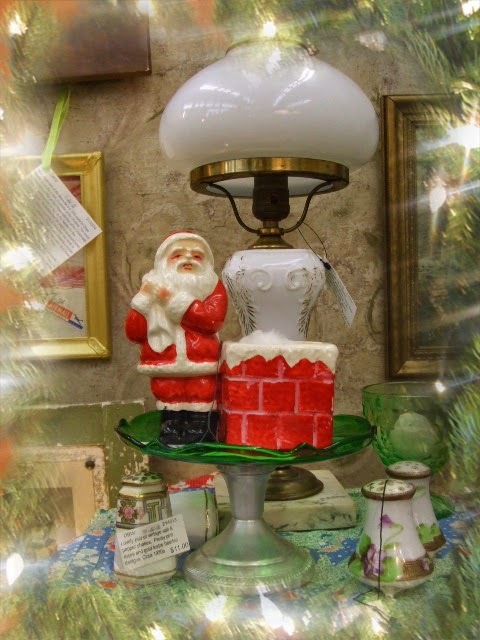 Mid Century Santa figurine looks quite happy on the Depression era compote. 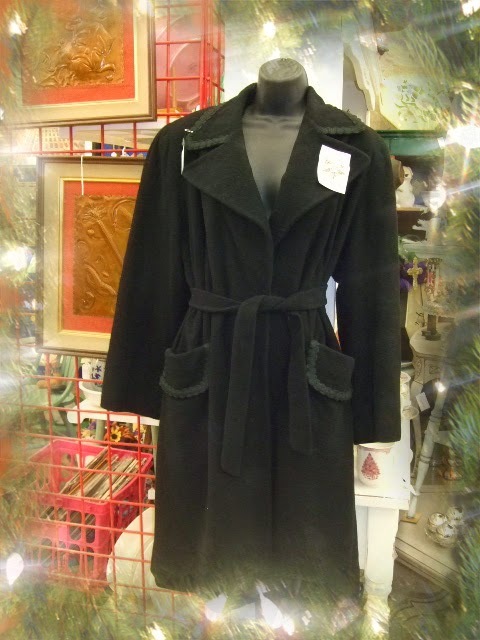 Great 1940s wool coat with braiding trim around collar and pockets. Has that great 1940's fitted waist. 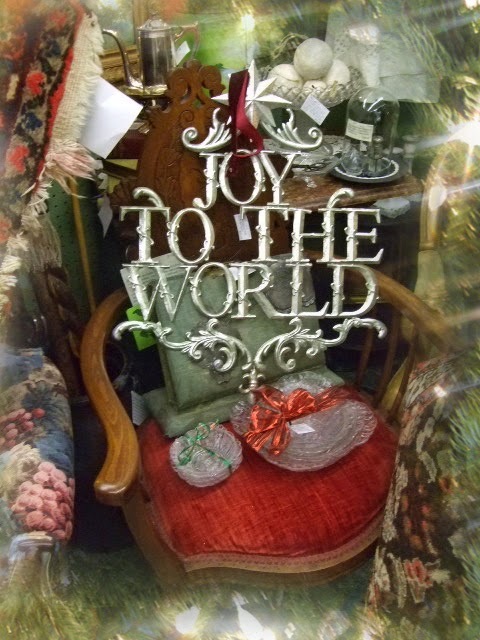 Pretty silverleaf Joy to the World sign can be used indoors or out. 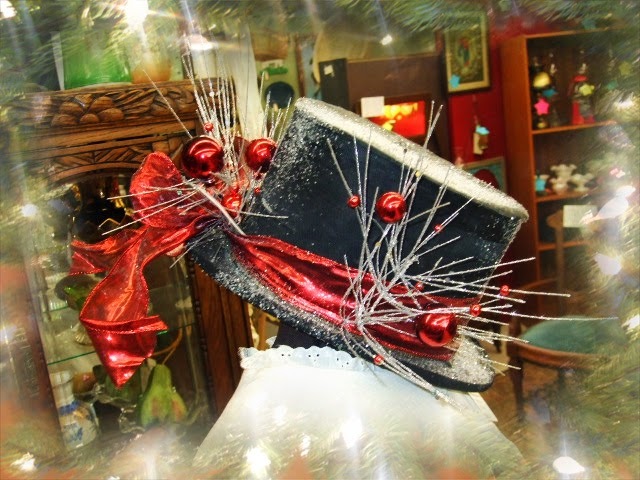 Decorating an antique top hat that has seen better days has become a yearly tradition with me. Love the holiday look to them. 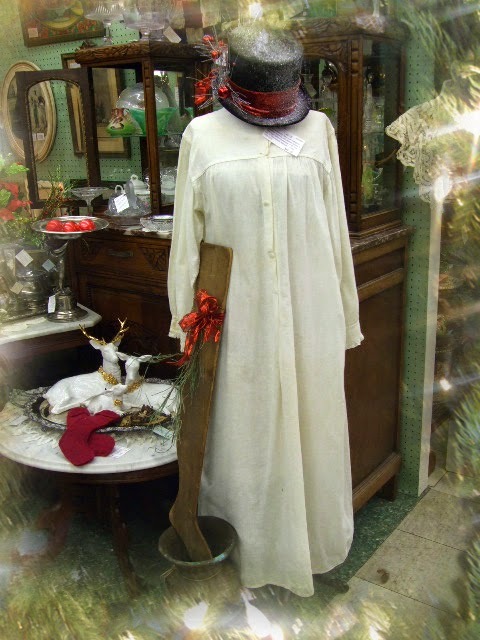 The top hat marries up well with the antique nightgown. 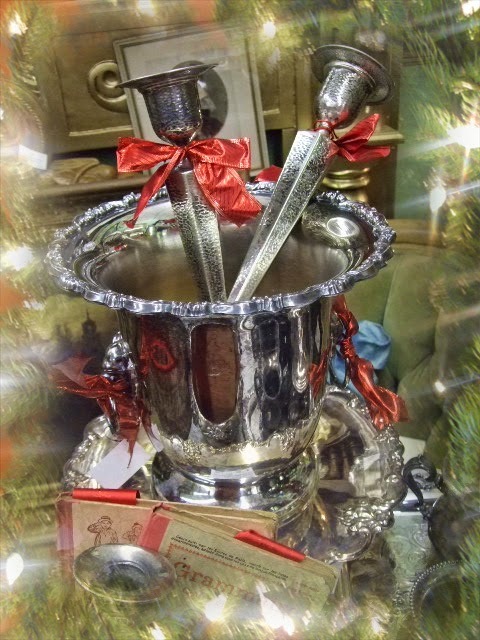 Found this great, mid century, Leondard silverplate champagne bucket and Art Deco hammered silverplate candlesticks. Both are perfect for holiday tables. 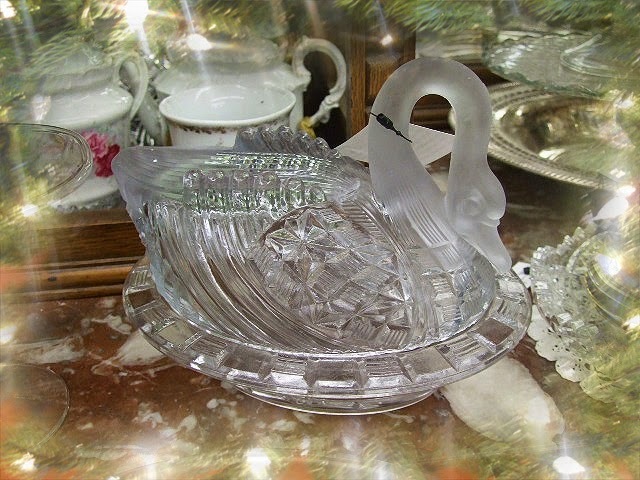 Marvelous EAPG, Satin Crystal Block Swan Covered Dish. 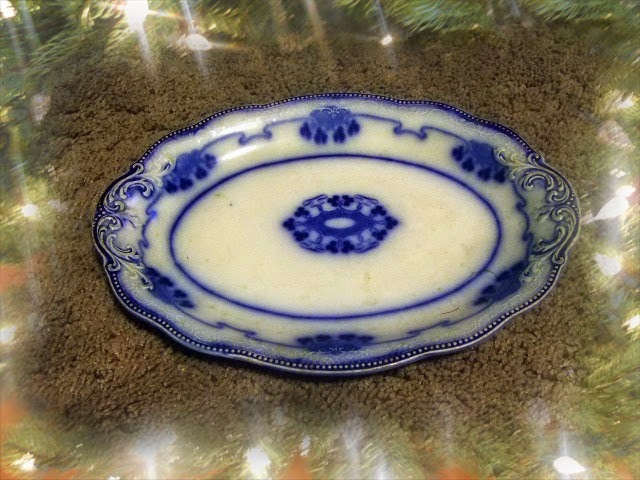 Made by Challinor Taylor in the 1880’s and most often found in Milk Glass, this is seldom seen in Crystal Satin. Called the Block Swan because of the block pattern on the lid and the base. 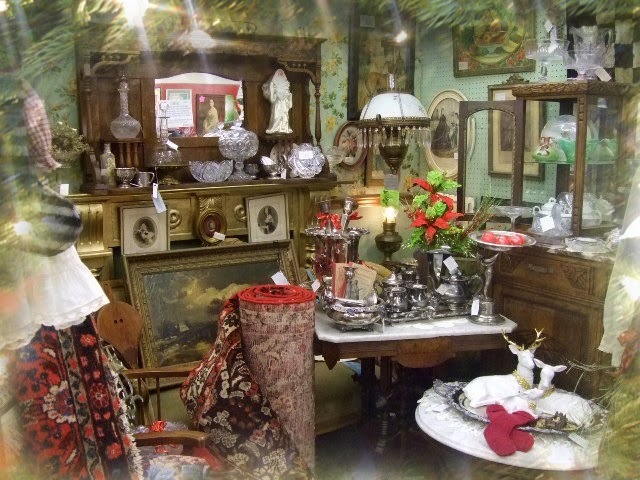 My Victorian booth is filled to the brim with antiques for the holidays. It was a lovely fall weekend for the Open House at Hodge Podge and for treasure hunting. 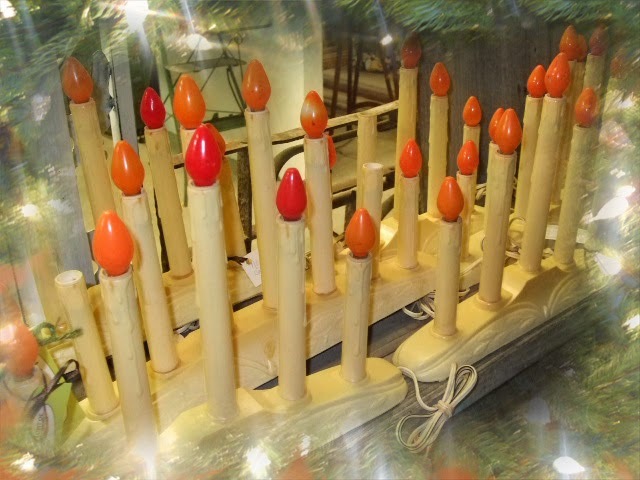 November is here and is the month for Holiday Open Houses at local communities. They almost always all fall on the same week making it difficult to pick and choose which to attend. The Buford Queen of Hearts (where I have two spaces) shook things up a little this year by holding the Buford location a week earlier than in the past. What a BRILLIANT idea. Not only was it a gorgeous fall evening but in holiday fashion, the QoH had most of its 200 dealers working the floor and greeting guests, serving homemade goodies, wine, mulled spice apple cider. The Queen was packed with shoppers and sweet Gynness and I couldn't wait to see all of the holiday goodness and take pictures for this blog post. There are lots of photos to look at and if you missed last evening's opening night, you still have through Sunday to be a part of this annual tradition. 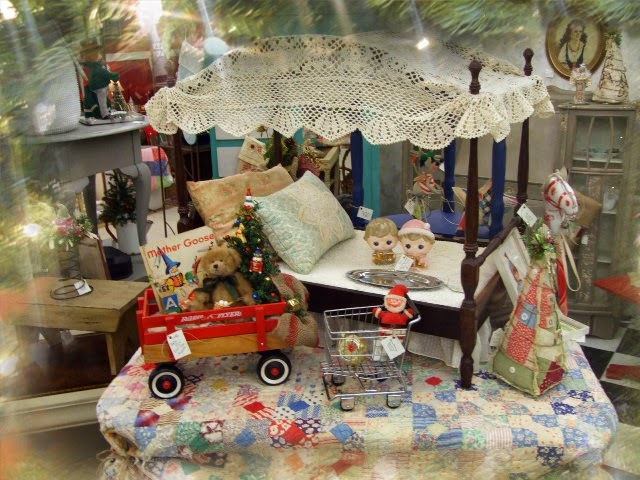 Pretty little canopy doll's bed is also perfect for your favorite furry four-legged. One of my favorite spaces, this booth always has the niftiest decorative pillows EVER! 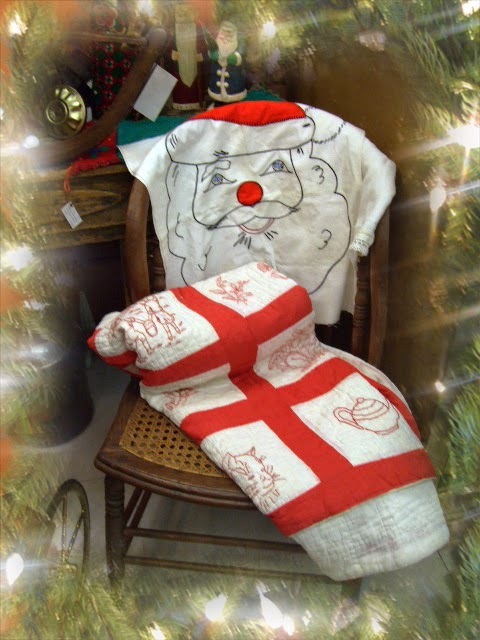 I missed out on buying some delightful Thanksgiving ones so I will have to grab one or two of these Christmas pillows. The Buford Queen of Hearts dealers pulled out all of the stops to decorate their booths. Love these pretty paper and glitter ornaments. This space is filled with the prettiest tinsel trees ever. Crazy about the pair of huge, brass candle sticks. These will look lovely as the sun goes down and they throw that lovely golden glow from candlelight. Sweet nutcrackers are always fun. These adorable bears are huge and would look darling at front door entrance. Crushing on this gorgeous Victorian, hide chair and ottomon. 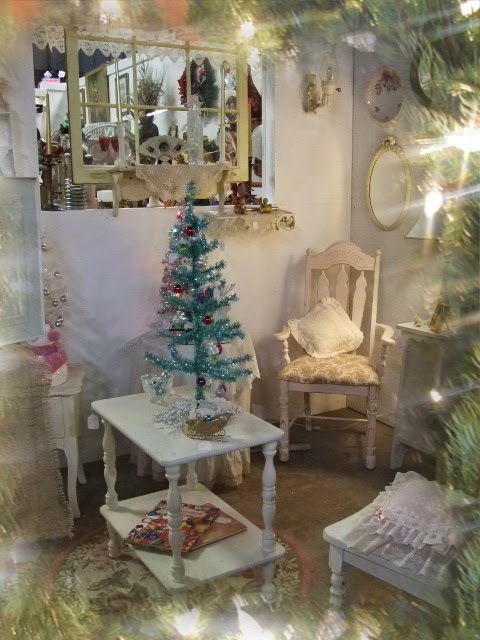 Love the sparkle of vintage, aluminum trees. How clever...thrift store silverplate is repurposed into serving trays using a wood base. So many spaces are filled with goodness. Just love this palest of pink, windsor rocking chair. Thanksgiving and Christmas decorative elements abound. Even more joy. Huge piece of antique wood with painted JOY on it in Christmas Red. My sweet Gynness has a great time strutting up and down the aisles, sniffing at the good smells and hoping a cookie would drop to the floor. Lovely Christmas tree if filled with pinecones. Crazy about this brilliant idea of a black and white, vintage photo behind a window. Like peering into a time forgotten. A metal bucket of Indian corn is pure, Thanksgiving delight. Grateful, thankful, blessed. Says it all. Love these mica pieces for their quiet elegance. Terrific "man cave" items are found everywhere within this space. Large, stain glass panels and heralding angels are looking for a front entrance to decorate. Bird cages make the sweetest village themes. One of my favorite spaces for treasure. Jonesing for that candle lamp to the left. My neighbor's space on Queen Street, they always have the most fun, decorative elements. 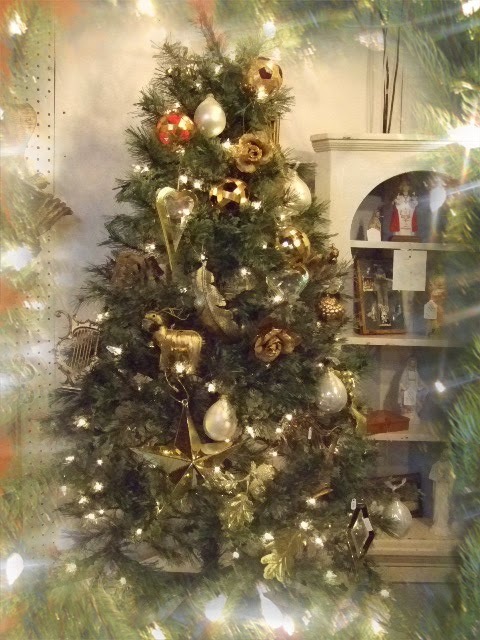 This is a 5 foot tool metal tree filled to abundance with unique ornaments. Sweet fox at the same spot. Deer are such lovely decorative pieces for Christmas. 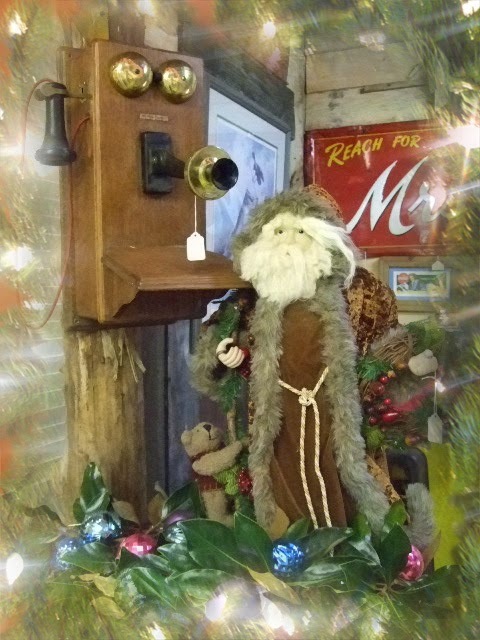 Marvelous vintage metal truck would look adorable holding Christmas cards. 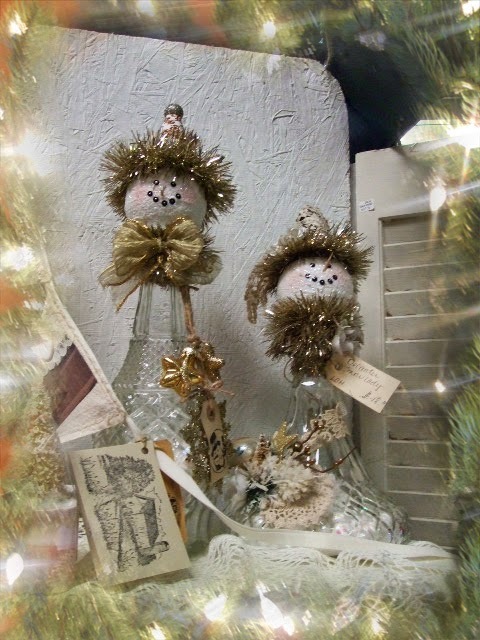 Vintage, glass ornaments are in my space and many others. This looks like a welcoming family room. I can see little ones gathered around opening gifts. Pretty little Christmas florals are perfect housewarming gifts. These saws just scream for bright red ribbons and garland. What fun they would be to use as a decorative element. Another beautiful space that looks like a page out of Country Living Magazine. Marvelous, mid century boudoir chair takes on a nostalgic look with the celery green wreath pillow. 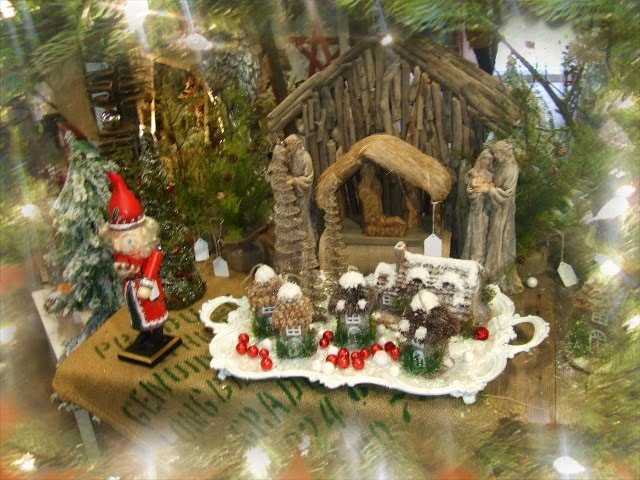 A festive display will look great just about anywhere. Sweet lamb is looking for a tree to snuggle under. Love everything about this display. From the floor to the ceiling, there are holiday decorations everywhere. Antique violin case has been repurposed into a pretty display. Fragment's space always has the most "curious" of things. Antique papers and found objects just delight me. 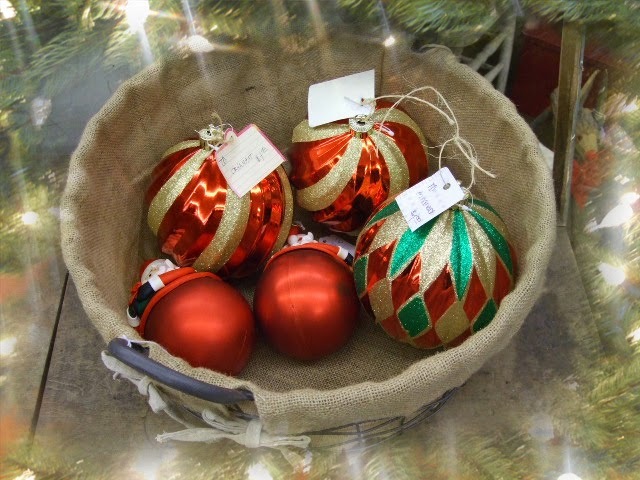 Festive ornaments look as pretty in a burlap covered bucket as they do on a tree. Joyful cottage Christmas decorating at its best. The simplicity of shiny, red ribbon against old barn wood is visually lovely. Love these knitted stockings for their joyful colors. Dove of peace is painted on old gate. Another of one of my favorite spaces, always filled with pretty things. Big, thrown clay snowman is room for a candle so his face lights up. It is now 48 days til Christmas and that pretty chalkboard countdown calendar is too cha cha for words. I could have taken a hundred more photos and still not captured all that you will find at the Buford Queen of Hearts. 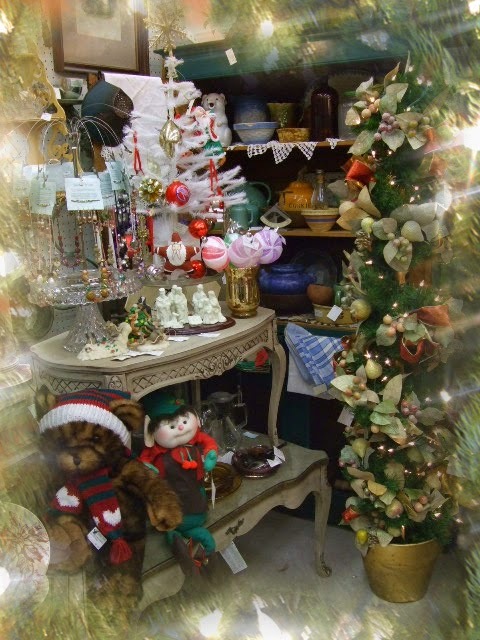 So, come celebrate the holidays with us, there is so much to see, to obtain decorating ideas, and of course, find treasure for your home and for gift giving.